Why first method answer didn't match second method? On a circular track of length 100m. 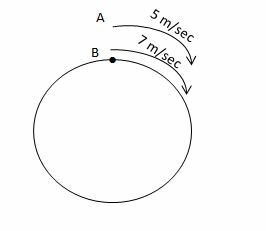 A and B start running clockwise from the same point with speeds of 5m/sec and 7m/sec respectively. After how much time will they meet for the first time while running? Difference = 2; It's their second meeting. A does 2.5 rounds, B does 3.5 rounds. Then difference is 1. It means faster guy “B” overtakes “A” for first time. When would they first meeting would happened. After 100/3 sec, A and B meet for first time. Last edited by skipjack; October 4th, 2018 at 10:41 AM. Last edited by idontknow; October 4th, 2018 at 04:06 AM. WHY are you trying your obscure 2nd calculation? Can I use this formula for all circular track problems? Last edited by skipjack; October 4th, 2018 at 10:39 AM. Why did you give "100/(7 - 4)" instead of "100/(7 - 5)", which gives 50 seconds, as expected. Yes, for all SIMILAR problems. Why did you wrote this 4 equations in the solution? They're just the steps that can be used to solve for t, given the first equation and that b doesn't equal a. C'mon Ganesh, that's a silly question: are you joking?